RICHARD FERRIER was baptised in 1686 in Weare Giffard, on the Torridge south of Bideford. 1686 Richard s. of John ffarrier & Mary 24 May. He was the son of John Ferrier and Mary Robbins. He is thought to be one of five children, four boys and one girl, another boy having died in infancy before Richard was born. His grandfather was a husbandman and one of his brothers a yeoman farmer, so it very likely that Richard grew up on a farm. Six years before he was born was born, the Fortescues, who were lords of the manor of both Weare Giffard and Filleigh, began to remodel the Tudor manor house at Filleigh. Richard himself moved the 12 miles to Filleigh in or before 1711. Castle Hill, the mansion of the wealthy Fortescue family. In 1684 Arthur Fortescue of Penwarne in Cornwall took the Tudor or medieval manor house, whose forecourt had faced into the hillside and began to reconstruct and enlarge it, so that it faced out across the valley. In the early 18th century Hugh Fortescue built a mock ruined castle on the hill behind, from which the house now takes its name. On the opposite ridge stands a monumental arch. The house was further enlarged in the 19th century. MARGARET SQUIRE’s baptism has not been found in Filleigh. But since the parish registers have only survived from 1685, she may well have been born in the parish where she married. She would have to have been 26 or older at the time of her wedding. The late 20s was a typical age for couples to marry. There was a family of Squires in Filleigh at that time. Edward and Mary Squire had their first known child baptised in 1686, a year after the registers start. Another son, whose baptism is not recorded, died the same year, so Edward and Mary were certainly married earlier than that. If this supposition is correct, Margaret would have been born in the early 1680s, in the closing years of Charles II’s reign. It would give her at least two brothers and two sisters. There may have been others. There are no other Squires in the registers, so Edward probably moved in from another parish. Margaret would not have been part of an extended family as she grew up, at least on her father’s side. On the other hand, no Squires appear in the 18th century records of Filleigh freeholders or tenants paying land tax. If Margaret’s family was similar in standing to Richard’s, she may have come from elsewhere. Some Squires in the locality were of higher standing still. In 1723 Richard Squire of nearby Chittlehampton had hundreds of people come to his house to take an oath of loyalty to George I. The archives of Fortescue of Castle Hill have several late 17th century mentions of Christopher Squire, gent, of South Molton. Whether born in Filleigh or not, by the time of their marriage in 1711, both she and Richard were ‘of this parish’. 1711 Richard Ferrier and Margret Squire both of this parish were married by Banns. May 12th. Although Richard appears to be one of the youngest in his family, the Ferriers of Filleigh seem to have been quite affluent. 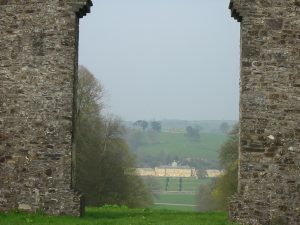 In the 1780 Land Tax his grandson, Richard Ferrar, is listed as the owner and occupier of five properties in Filleigh. These seem to be a group of farms in the north of the parish. The older Richard may also have owned at least some of them. On 19 September 1723, in the wake of Jacobite plots, Richard travelled four miles to Chittlehampton to take the Oath of Loyalty to the Hanoverian King George I and the Protestant religion. He was on of 652 people who swore the oath there over the next three days. Unusually, the ceremony was held at the house of Richard Squire, and not at a public venue such as an inn. 14 Filleigh parishioners took the oath. These Chittlehampton signatories were not a cross-section of the population. They seem to have been freeholders. Most, but not all, were men. The oaths were administered ny Arthur Chichester and John Hacche esqs. Richard Ferrar (Ferrer) of Filleigh is recorded as having signed his own name. This was true of 42% of oath-takers in Devon,, others making their initial only or a mark. Margaret died in 1742. She was probably around 60. Richard survived her by another 12 years. He was 68 when he died. In 1755 Robert Ferrer is registered as being a freeholder of Filleigh in Braunton Hundred. His relation to Richard is unclear. It is possible that this is a mistaken entry for a younger Richard. The oath of loyalty which Richard signed was felt to be necessary following the Attenbury Plot. The Atterbury plot has been described as ‘a serious and intelligent project which adapted itself thrice to the rapidly changing situation of an England in extreme crisis’. The rebellion of 1715 had failed to enthrone James Stuart, son of the deposed King James II, in place of the Hanoverian George I. It was followed by a number of other plots, all involving a landing in the West Country. The Atterbury plot was the last in this series. In 1716 James, the Old Pretender, appointed Francis Atterbury, Bishop of Rochester, as his representative in England. Atterbury was a talented advocate of the High Church He had formerly been archdeacon of Totnes His appointment as Bishop of Rochester in 1713 gave him a seat in the House of Lords. The Tory ministry collapsed in 1714 and was followed by a vigorous Whig purge. It left the Tories excluded from high office. Atterbury had no affinity with the Jacobite cause before 1716, and he had little sympathy for the Catholic Church. However, the sea-change in English politics that took place in the early years of George I’s reign turned the High Church bishop into a fully-fledged Jacobite conspirator. His increasing despair that the Tory party would never regain sufficient power to restore the Anglican Church to what he considered to be its rightful place in English life and society brought him to the view that only a Jacobite military intervention could break the Whig hegemony. Despite the best efforts of Whig propagandists to draw links between Jacobite conspiracies and England’s small population of Catholics, Jacobitism was really a movement of High Anglican Tories. Like his father before him, James Stuart was a Roman Catholic. However, this was only of minor concern to the conspirators. The Whig hegemony that followed the succession of George I led a number of leading Tories to pursue desperate measures in their attempts to regain power. It has been suggested that, at the time of the Atterbury plot, all but a handful of leading Tories were active Jacobites. The intensification of Jacobite scheming in 1720 was due to the collapse of the South Sea Company, which caused financial ruin to many and provoked outrage against the Whig ministry and the House of Hanover, who were implicated in the scandal. It was this dissatisfaction that the Jacobite party sought to exploit with the plots of the next two years. The plan was for the capture of London and the city of Westminster to precede a rising in the counties. This involved a landing in Cornwall to lead a revolt in the West Country. Atterbury was arrested on 24 August 1722. He was exiled for life, and became secretary of state to the Pretender James Stuart. A list of leading Jacobites compiled for James shows 21 firm supporters in Devon. This is the third strongest county representation, after Cornwall and Warwickshire, and just ahead of Somerset. Whether this betrays genuine Jacobite fervour in comparison with other parts of the country is not known. The Devon section is headed with the comment, ‘Numerous in Cloathiers and Manufacturers most idle at present and discontented’. This suggests that the depression in the county’s serge industry at this time led the plotters to believe they might exploit the dissatisfaction of under-employed workers. The Devon entries on the 1721 list reads like a directory of the leading Tory gentry in the county. This does not mean that all Devon was a hotbed of Jacobite sedition. Disturbances among weavers were mainly economic riots. Nonetheless, they demonstrate the type of local discontent that the Jacobite leaders were seeking to exploit. 27 May 1723 George I gave royal assent to ‘An Act for granting an Aid to His Majesty by laying a Tax upon Papists’ and ‘An Act to oblige all Persons being Papists…, and all Persons… refusing or neglecting to take the Oaths appointed for the Security of His Majesty’s Person and Government…, to register their Names and real Estates’. The 1723 Oath Act declared that all persons failing to take the oaths of allegiance, supremacy and abjuration by 25 December 1723 must register their names and real estates before the courts. The penalty for failing to comply was forfeiture of their estates. Whilst the legislation was aimed primarily at Roman Catholics, it also targeted those who refused the oath (non-jurors). The oath taker was to declare that ‘our SovereignLord King GEORGE is lawful and rightful King of this Realm’ and that he/she would ‘defend him to the utmost of my Power, against all traiterous Conspiracies and Attempts whatsoever, which shall be made against his Person, Crown and Dignity’. The person swearing does ‘renounce, refuse, and ajbure any Allegiance or Obedience’ to the Pretender. It was explicitly anti-Catholic: ‘I A.B. do swear, that I do from my Heart abhor, detest and abjure, as impious and heretical, that damnable Doctrine and Position, that Princes excommunicated or deprived by the Pope… may be deposed or murthered by their Subjects… no Foreign Prince, Person, Prelate, State or Potentate, hath or ought to have any Jurisdiction, Power, Superiority, Pre-eminence or Authority… within this Realm’. Such wording sought to foster and exploit anti-Catholic sentiment by reminding people of Britain’s protestant past, drawing links between the Pope, heresy and a potential foreign invasion. It sought to construct a sense of national protestant identity around George I, a foreign monarch who had a poor command of English. The 1723 Oath Act stated that all persons aged 18 years and above ‘not having already taken the Oaths appointed in and by an Act made in the first year of his Majesty’s Reign’ must now swear’. Under the earlier 1715 Oath Act only certain officeholders were required to take the oaths. Since all officeholders were male, this did not include women. Now that the oath was to be widened to include other sections of the population there was no explicit statement that only men needed to swear. In addition, no wealth qualification was either implied or explicitly. Thus in some areas the entire adult population paraded before the justices of the peace, women lining up alongside men for the first time on such an occasion. According to Arthur Onslow the response of the populace in 1723 to this measure was far from enthusiastic: I saw a great deal of it, and it was a strange as well as ridiculous sight to see people crouding to give a testimony of their allegiance to a government, and cursing it at the same time for giving them the trouble of so doing, and for the fright they were put into by it; and I am satisfied more real disaffection to the king and his family arose from it than from anything which happened in that time. Since the alternative to swearing was to register one’s estates it would follow that anyone who did not own property did not need to swear the oaths. Middlesex Quarter Sessions stated that the oath was to be taken by all persons ‘as well women as Men… having any Freehold, Copyhold, or other real Estate’. A similar order was published by the Devon Quarter Sessions at about the same time. Only those with ‘Lands, Tenements, or hereditaments, of the clear yearly Value of Ten Pounds, or upwards’ were expected to swear. No evidence has been found of any Devonians being penalised for not swearing. The oath taking was conducted at adjourned Midsummer and Michaelmas Quarter Sessions at locations within 45 different parishes around the county. Over 25,000 men and women of Devon, about one-fifth of the adult population, signed or made their mark. In general the sessions were held in market towns or larger parishes, often at a local inn. Less frequently, an individual’s house would be used, such as the home of Richard Squire in Chittlehampton where 652 people took the oaths on 19, 20 and 29 September. Not all of those who swore may actually have recited the full text of the oaths. Evidence from the Protestation of the 1640s shows what might have happened. At St Katherine Cree in London the text was read aloud by the minister, after which ‘the people expressed themselves after this manner as follows: I A.B. in the presence of Almighty God freely and heartily promise, vow and protest the same which the leading person George Rush did’. There is an account from 1710 of the oath of admission to the Bodleian Library, Oxford, which provides a sense of the ritual elements that still surrounded oath taking in the early eighteenth century: He first gave me the oath to look over, and then took a little Greek testament from a bag, gave it open into my hand, and himself read the oath aloud to me, while I kept two fingers of the right hand on the open book. After this… he guided my hand with the book to my mouth, to be kissed, which is a form usual in all oaths in England. The raising of three fingers in acknowledgement of the Trinity was another commonly employed ritual associated with swearing. As well as the inconvenience of having to travel to a suitable location to take the oaths, the oath takers also appear to have had to pay a small fee. The 1723 Oath Act states that ‘for taking and subscribing the Oaths and Assurance appointed by this Act, three pence shall be paid, and no more; and for any certificate thereof, if required, One Shilling, and no more’.